This is the cover Amazon Shorts developed for the first of my serialized stories featuring Dr. Nekros. The Amazon Shorts program an initiative through Amazon.com where the reader can download an author’s work for only $00.49. Amazon.com will store the story for you in a digital locker, email it to you in the body of an email, and also email it to you as a PDF. 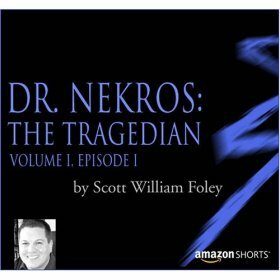 This entry was posted in Author News and tagged Amazon Shorts, Amazon.com, Dr. Nekros, Dr. Nekros: The Tragedian, scott william foley.